My interest in travel hacking is increasing each day. I want to know as much as possible how to travel free, if not discounted. It may be unfamiliar terms for now but to those who travel a lot and wants to score the best deals, they do it unknowingly what it is called. Example are travel expo's where one can shop for the biggest promos offered by participating travel brands. That is why I am sharing an event where travelers and adventurers are in for the best deals of the year as the grandest and most awaited tourism event “Travel Tour Expo (TTE) 2016” will once again offer the best rates and discounts. TTE 2016 is slated at the SMX Convention Center, Pasay City on February 5, 6 and 7, 2016. Organized by the Philippine Travel Agencies Association (PTAA), TTE will showcase over 300 exhibitors from various sectors such as airlines, resorts, hotels, domestic tour operators, national tourism organizations, travel agencies and other stakeholders offering various products, flights, travel packages and more. This year, PTAA also welcomes an innovation to its successful travel event by simultaneously mounting the International Trade Expo (ITTE), a business-to-business travel trade expo devoted towards tapping the growing Philippine market for overseas travel. It will gather exhibitors, sellers, hosted buyers all over the country and travel agents under one roof. PTAA conceptualized the TTE in 1994 to showcase the products and services of its members. Over the years, the travel fair has become the grandest annual event in the industry including all segments of travel business. 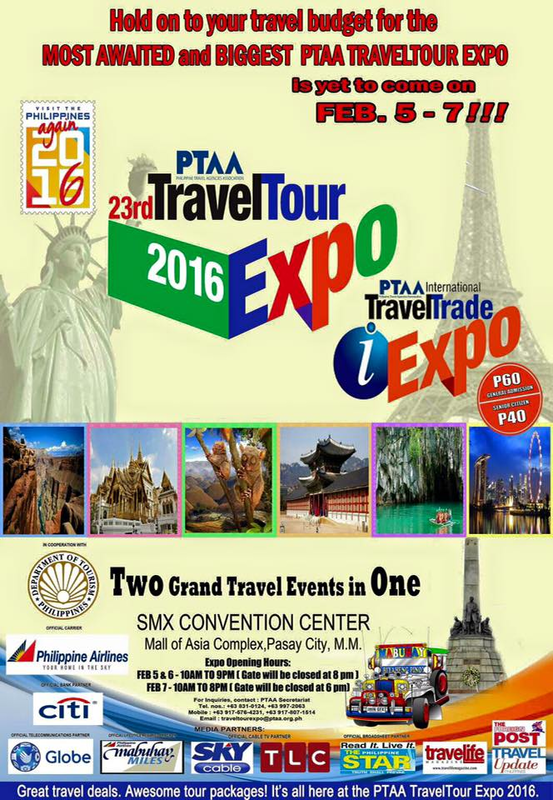 For details, call 831-0124, 904-9280, 552-0026 or email traveltourexpo@ptaa.org.ph. 1. On Feb 5-6, expo hours is from 10am - 9pm but gates will close at 8pm while on Feb 7, schedule is from 10am to 7pm but gates will close at 6pm. 4. There's a lot of promos going on! Stay there more than just a mere dropping by!